Hellebores (hel-leb-or-us), Ranunculaceae Family, are the harbingers of spring, blooming for six weeks or more beginning in late winter. They are often flowering during the Christian season of Lent, from which they get their common name, Lenten Rose. This is the perfect plant for naturalizing in moist, woodland areas where its extensive root system will spread as far as it is allowed. Hellebores are enjoyable to grow because they are low-maintenance and disease/pest-free. Simply trim back last year's foliage in the spring. They can adapt to almost any growing conditions. Though they prefer rich, moist, organic soil, they will also grow in sandy or clay soil. They can even tolerate short periods of drought. The soil pH can range anywhere from slightly acidic to slightly alkaline. To increase the number of hellebores in your garden, mulch them heavily in the fall. The new seedlings will grow in this mulch come spring and can then be transplanted elsewhere in the garden. WARNING: Hellebores are poisonous. Do not consume any part of the plant! Hellebores are shade plants that need to be protected from the hot afternoon sun. They will grow in full shade under large deciduous trees as long as they receive full sun from winter to spring before the trees get their leaves. There are currently 20 species recognized within the genus Helleborus which is a member of the family Ranunculaceae. Hellebores have experienced a surge of interest over the last several years due, in the main, to the realization that they are much hardier and easier to grow than previously thought. Native to Eastern Europe and Asia these striking plants never fail to lend an air of the exotic to any garden. Their tropical appearance and often evergreen habit once condemned them to the gardens of collectors and connoisseurs but through the concerted efforts of several talented breeders these wonderful plants are entering the mainstream. The two most commonly seen species are known as Christmas Rose (H. niger) and Lenten Rose (H. orientalis), due to the time of year in which they flower and the single rose-like appearance of their blooms. However Hellebores are not members of the family Roseaceae and can in fact be poisonous if ingested (like most Ranunculaceae) - so do not be tempted to indulge in any Christmas Rose Petal Tea! However this trait does have the advantage of making them quite resistant, if not immune, to the ravages of hungry deer and other garden pests. Hellebores are happiest in a shaded location, preferably produced by deciduous trees. This ensures that they are in full sun when they are flowering but in a more sheltered position for the heat of the summer when they generally enter a period of dormancy. They must have rich but well drained soil, in fact once established they are more likely to succumb to the 'kindness' of overwatering than the 'neglect' of drought. Think of them as Sedum for the shade! Their foliage is generally tough, leathery, dark green to bluish green with some cultivars having a silver/pewter cast to them. As well, there are several variegated selections available but they do tend to be a bit trickier to keep happy. The plants form nice showy clumps as they become established. Due to their evergreen tendencies and early blooming, it is best to wait until after flowering to 'tidy up' any winter scruffiness. If planting or moving bare root, better success will be experienced in the early autumn while plugs or containerized plants can be transplanted at almost any time. The flowers are of course what draw most people to these plants. The five (singles) showy sepals are quite tough and frost resistant - an adaptation to their early blooming, in addition they stay on the plant for an extended period of time providing a show long after pollination has taken place. The flowers are sometimes held protected amongst the foliage but hybridization is producing more adventurous and visible blooms in an extended range of colors and forms with several doubles now available. Helleborus x hybridus is the generally accepted name for the more complicated of the breeding results, but they are still commonly known as Lenten Rose and are primarily H. orientalis. They even make spectacular cut flowers - best displayed by floating the blooms in a shallow bowl - the more the better! Attributes: Border plants, Container, Cut flower or foliage, Drought Tolerant, Evergreen, Mass planting, Salt Tolerant, Deer and Rabbit resistant. PLANTING: Set plants 12 inches apart, in a rather fertile soil that is well-drained but moisture retentive. 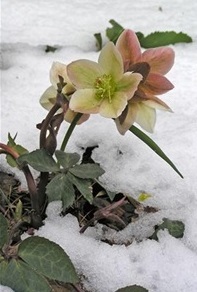 Helleborus does best in partial shade, but can tolerate full sun in northern areas. For the taller species and cultivars, choose a somewhat sheltered location. MAINTENANCE: We recommend a year-round mulch, to conserve moisture and keep the soil cool. If plants must be divided, do so carefully, as they tend to be brittle. H. orientalis hybrids transplant readily; others are happier left undisturbed.